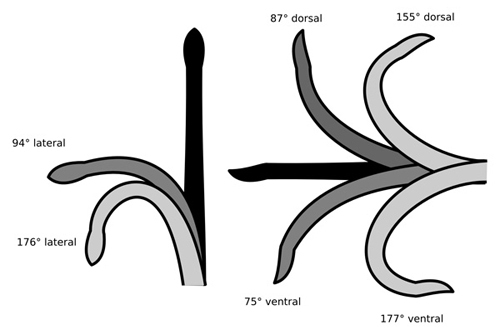 Ranges of elasmosaurid neck motion as estimated by Zammit et al. 2008. Elasmosaurids weren’t the completely stiff-necked creatures they’re sometimes made out to be — even a tiny amount of flexibility between vertebrae adds up when you have 70+ neck bones. But why did plesiosaurs have such a long neck in the first place? This is a difficult question to answer because 1. plesiosaurs are extinct and left behind no living descendants, and 2. there are no other extant aquatic long-necked organisms to provide analogues. To my knowledge (and correct me if I’m wrong) there are no long-necked fish, cetaceans, sea turtles, or any other long-necked organisms that spend their entire life underwater. At least not to the extent seen in plesiosaurs. Elasmosaurids were weirdos, but they maintained this long-necked bauplan for 135 million years, so they were successful weirdos. The long neck also evolved independently in different plesiosaur lineages, some cryptoclidids have extremely long necks too, for example. This all indicates a strong selection pressure (or pressures) driving the evolution of the long neck in plesiosaurs, despite the great risk involved in exposing such a delicate part of the anatomy in an ocean filled with super-predators. The long neck was therefore obviously doing something(s) useful. However, we can only really guess what. Here are the top possible functions for the long neck in elasmosaurids (I’ve ruled out those possibilities that would require flexibility greater than the estimates given above). Some of these ideas are reasonable and have been suggested before, while others are, ahem, unreasonable and quite ridiculous. 1. Stealth device. Fish are stupid. 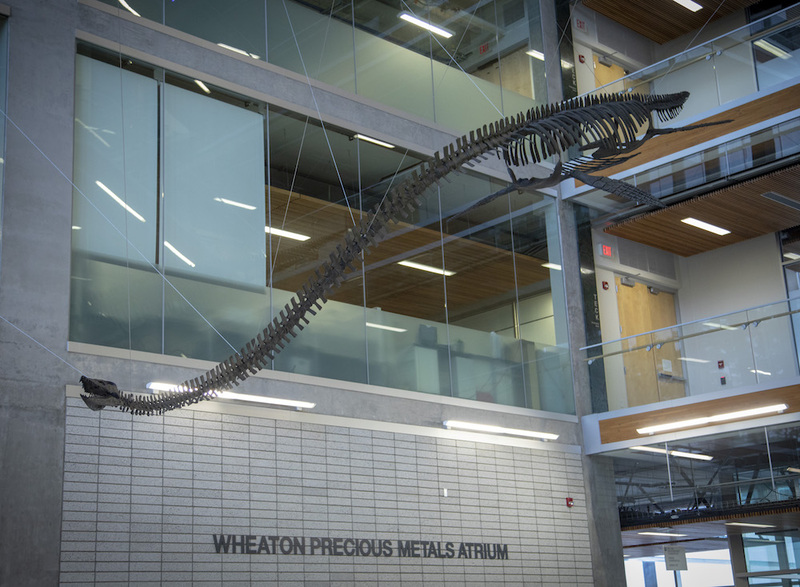 The long neck provided distance between the bulky body of the plesiosaur and the unsuspecting prey. 2. Getting into tight spots. Helpful for hunting in reefs, crevices, and kelp forests. 3. Sexual selection. The equivalent of a peacock’s tail – the longer and more brightly coloured the better. 4. Food storage. Hamsters have cheeks, plesiosaurs had necks. This might not be as ridiculous as it sounds. Leatherback turtles do something similar (despite their incredibly short necks) by having an extended oesophagus that wraps around the stomach. Their prey (usually jellyfish) is held in place in the oesophagus by backwards-pointing projections (papillae) while excess water is expelled. After temporary storage in the oesophagus the morsels are transported to the stomach. Perhaps elasmosaurids were jelly fish specialists too? 5. Bottom feeding. Hunting in soft sediment. I’m not sure how the long neck really helps here – maybe something akin to number 1? 6. A snorkel. An air supply for staying submerged for prolonged periods of time. 8. Energy saver. Moving costs energy, so a long neck might allow the plesiosaur to feed, slumped on the sea bed, hardly moving its body in the process. 9. Electrogenic organ. Plesiosaur necks housed electrocytes and so longer necks create higher voltage electric fields. For electrolocation (sensing prey), elecrofishing (stunning prey to be consumed at leisure), and/or electric defence (to protect from pliosaurs and mosasaurs). This hypothesis comes from here, and was raised to my attention by Darren Naish. 10. Wrench of death. Grab and twist – for pulling ammonites out of their shells. Originally suggested here – thanks again to Darren Naish for reminding me. Twist feeding has also been suggested for short necked pliosaurs, for which it makes morse sense to me. Zammit, M., Daniels, C. B. and Kear, B. 2008. Elasmosaur (Reptilia: Sauropterygia) neck flexibility: Implications for feeding strategies. Comparative Biochemistry and Physiology, Part A, 150, 124–130. What about suction feeding? It is practiced by some long-necked aquatic turtles today. I think it has been proposed for tanystropheids. Other may be being able to bite (and perhaps eat) soft parasites or animals attached to its own body. Or allowing the head to move much faster, thanks to the simultaneous contraction of muscles in the many successive joints, each one adding to velocity at the tip. Useful if the body was slow. Nice post. Wasn’t there also a suggestion that the neck could whip side to side to get the head moving much faster than the body? This is a slightly updated take on the snake-like strike you see in some older pictures. The timing of this post could not have been better. I plan to discuss plesiosauromorph foraging strategy soon on antediluvian salad. Let’s just say I modify my “t-handled socket wrench of death” (name from yodelling Cyclist) idea and combine it with some of the other suggestions here in a manner that emphasizes opportunistic foraging of both benthic/pelagic small/medium sized prey. Far from a weakness, it should also be reiterated that the long neck must have conferred significant evolutionary advantage. Plesiosaurs are the most long tenured and , arguably, successful radiation of marine tetrapods of all time. 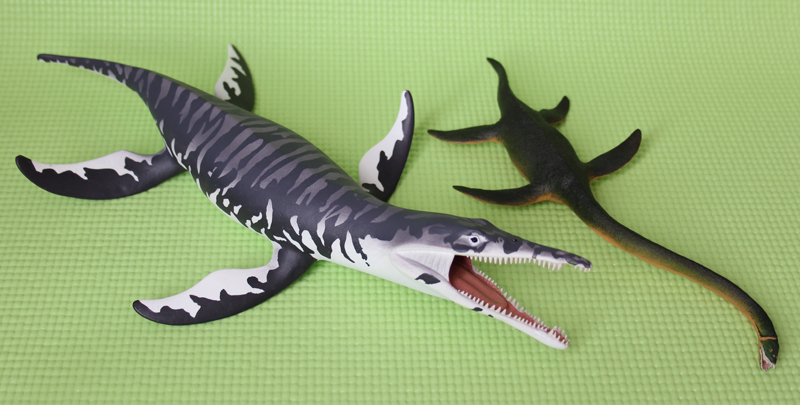 By the way who do I contact If I want to use some of the plesiosaur images from this site? @Duane Nash. You can email me about use of images from this site ([email protected]). If the images are mine and you want to use them for non-profit purposes I’m usually fine with that. Ooops maybe marine turtles have them beat. They still had a good go at it. The long and narrow neck may also have helped long-reach excavation in soft substrates to get infaunal invertebrates. Its advance through the bottom mud would require to displace a lesser volume of substrate than if the neck and head were wider. The neck length would allow increasing the reach within the bottom mud column. It is common among fossorial reptiles to have elongate bodies, perhaps for similar reasons. Can teeth wear allow testing the hypothesis of the teeth commonly contacting the sea bottom? This is close enough to function number 2 (with a little 5 as well) to be shoe-horned in that hypothesis. I quite like this idea – a sort of farm on the neck. I don’t think it is likely, but more importanty, it will make a great cartoon. I’ll make it so. Love the pictures, great summary! Just to clarify very slightly, I was inspired to write about necks as an electrogenic organ (#8), to explain how elasmosaurids were apparently bottom feeders. The inspiration was watching a video of a hammerhead hunting buried stingrays using its electrical senses to find them. I started wondering if that big ol’ elasmosaur neck was a sensory organ that helped them find hidden prey, and went from there. This isn’t to say that you should merge 5 and 9, but just to point out that the evidence for 5 inspired the zaniness of 9. Interesting project…. that said, I think it’s a bit of a mistake to consider the function of the neck of these plesiosaurs without taking into account other major features of the Elasmosauridae… Their eyes were placed to view generally forward and upward; their teeth were well adapted for trapping small, slippery prey (note that the narrow width of the skull limits the size of prey that could be swallowed – and meant that these large animals probably spent a lot of time feeding to fuel their metabolism) …. 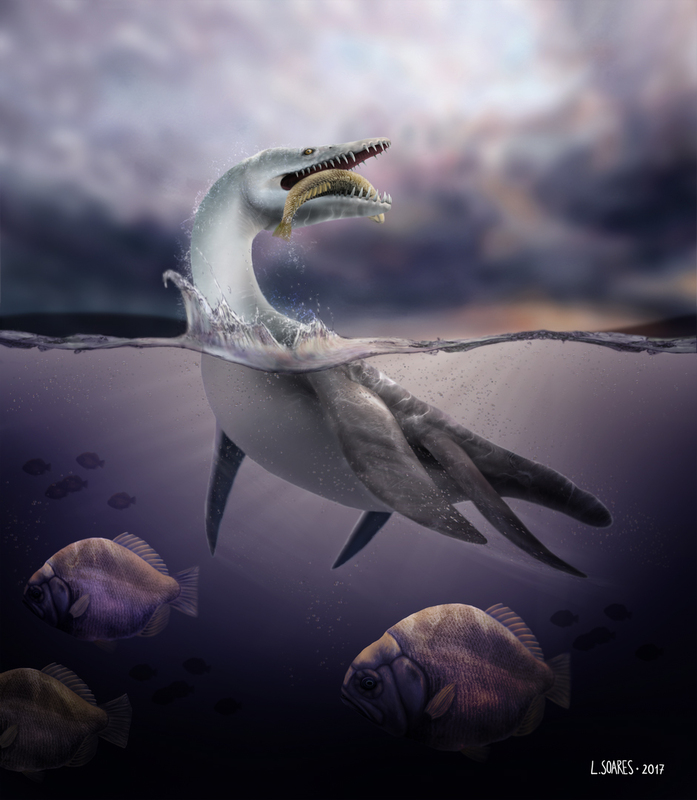 a review of preserved stomach contents shows an evolution of prey preference from cephalopods (Jurassic) to fish (Cretaceous); Most, if not all, had a ‘gizzard’ filled with gastroliths and used as a gastric mill to aid the digestive process; and lastly, moving the head from side to side, or up and down while swimming would have acted as a very efficient rudder / diving plane … making it difficult to swim in a straight line. I certainly favor the #1 alternative, but would suggest it would be much stealthier to approach a school of fish from below… and use the darker water to hide their large body. Yes, true, excavating a narrow tunnel is more o less the same as entering the head in previously made tunnels. Or the intermediate “widening the hole”, which may be accomplished by bowing the neck sideways one side and the other (or up and down, with the flattened, stiff skull acting as a shovel). I do not know too much about plesiosaurs but like forcing imagination. Are teeth naturally pointing somewhat outwards in these animals, or is that just a result of dorso-ventral compression by the strata? If natural, they may have used the teeth, coupled with a fast-moving head, to wound animals nearby with lateral movements. Or, to rake in the sediment probing for food. Very interesting summary, thanks for posting it. I hope this post is a trial balloon for a paper — an informal preprint, if you like. The obvious comparison to make is with sauropods — the other long-lived clade with long necks. Obviously they were ecologically very different, what with being terrestrial and all; but there are still important factors shared between them — for example, our understanding of neutral posture and range of motion in the necks of both groups is very incomplete. For what it’s worth, and not yet having read Zammit et al., I would guess that they have underestimated neck flexibility. For a 70-cervical elasmosaur neck, the predicted dorsal flexion of not more than 155° allows only 2.2° at each joint, which seems hardly credible. Consider how much flexibility there is in a human neck, which has only one tenth as many cervicals and similarly short-cylindrical centra. But I reserve the right to change my mind on this when I’ve had a chance to read the paper. Finally: in evaluating the sexual selection hypothesis (#3), you may find it useful to check out our paper doing the same for sauropods (Taylor et al. 2011) — especially the section titled “No single feature is sexually selected across any speciose tetrapod clade” on pages 8-9. @Mike Everhart I am dubious about drawing any strong conclusions regarding plesiosauromorph/elasmosaurid diet from stomach contents alone. The stomach remains we have are from but a few specimens from a select number of species across a vast amount of time i.e. not a compelling sample size. A predilection for small prey yes, but I do not buy the gape-limiting modus operandi for feeding that has dominated thought. We have cephalopods, fish, pterosaur, benthic invertebrate, scavenged icthyosaur remains associated with plesiosaur gastric remains. The strongest signal I see is one of an opportunistic feeder. If we allow for rotational feeding, especially in groups, this allows for a much wider feeding envelope than currently appreciated. See the feeding behavior of numerous eels/bichirs/crocodile species. Doubtless plesiosaurs would have been careful to avoid large bones and shells that might choke them, so any large(r) animal remains would not likely be preserved as stomach contents as only soft flesh would be swallowed. I have a more updated theory on “plesiosauromorph” feeding ecology emphasizing a group foraging modus operandi which I dub the plesiosaur phalanx attack and which utilizes several of the above feeding methods. This is a very interesting post. Elasmosaurid necks are indeed puzzling. I would agree with Mike that the #1 alternative is the best. Although it may be a mix of #1 and #5. Elasmosaurid and the long necks of plesiosaurs in general may be more complicated and useful than previously thought. After all as mentioned, they are the only marine vertebrates to evolve long necks throughout their long geological history. Elasmosaurids seem to be convergent with some members of the Cryptocledids(eg. Mureanosaurs) So, it was obviously a useful adaptation for the group. Nash suggested this in the previous post. Indeed their stomach contents consists of cephalopods, fish, and others that Mike mentioned. Which brings me to a research topic that I have been working on for a while now. I’m very curious about the ecological niche and guilds of plesiosaurs in general. The only modern “analogs” seem to be pinnipeds which a majority of the family members feed mostly on squid and fish. However, as far as neck function goes, I think the Common Snapping Turtle(Chelydra serpentine)has a long neck which it uses to capture prey on the surface of the water column and along the bottom, is most similar. I’m hoping to submit my research as an abstract for the SVP meeting this fall. Any reviewers would be good have! Can anyone send me the Zammit et al. 2008 as a PDF? It would greatly help with my project. What if it’s because it looked like a tail to other animals? And it confused predators.